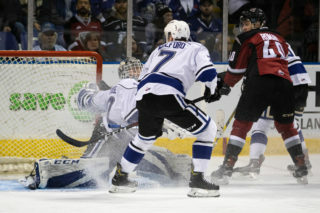 Victoria falls 8-2 to Kelowna; rematch goes tomorrow night at 7:05 p.m.
Victoria, BC – The Victoria Royals dropped an 8-2 contest to the Kelowna Rockets on Friday night. Royals – Dante Hannoun 1g-0a, D-Jay Jerome 1g-0a, Kaid Oliver 0g-1a, Igor Martynov 0g-1a. Kelowna – Lassi Thomson 2g-2a (Game Winner), Liam Kindree 1g-3a, Nolan Foote 2g-0a, Kyle Topping 0g-2a, Kaedan Korczak 1g-0a, Erik Gardiner 1g-0a, Dallon Wilton 1g-0a, Lane Zablocki 0g-1a, Connor Bruggen-Cate 0g-1a, Jack Cowell 0g-1a, Leif Mattson 0g-1a. 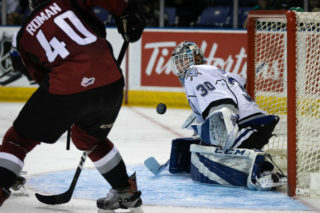 Royals – Brock Gould (L) – 40:51 mins, 16 saves on 22 shots. Joel Grzybowski – 19:09 mins, eight saves on 10 shots. Kelowna – Roman Basran (W) – 59:56 mins, 18 saves on 20 shots. Home Sweet Home: Of the Royals’ opening 10 games this season, eight have taken place at the Save-On-Foods Memorial Centre. 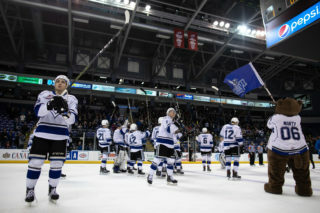 Victoria has played the most home games in the league and hold a record of 6-2-0-0 in those contests. 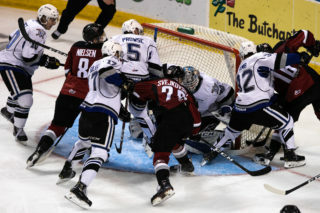 Penalty Shot: In tonight’s contest, Royals’ netminder Brock Gould stopped Kelowna’s Leif Mattson on a penalty shot. Since their inaugural season in 2011-12, Victoria has had 19 penalty shots taken against them and have only allowed three goals. Familiar Face: Former Royal, Lane Zablocki made his Kelowna Rockets’ debut tonight after he missed the start of the season due to an off-season injury. 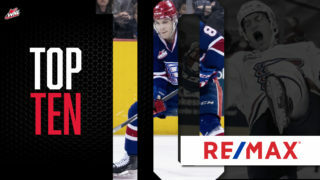 Victoria traded Zablocki to Kelowna in September for a conditional seventh round pick in 2019 and conditional fourth round pick in the 2021. Last season, Zablocki was acquired by the Royals at the trade deadline and recorded six points (1g-5a) in 25 games. Local Products: Kelowna has a trio of local players on their roster in forwards Ted Brennan of Victoria, Kyle Topping of Salts Spring Island and defenceman Kyle Pow of Nanaimo. Up Next: Victoria and Kelowna complete their two-game set against each other tomorrow night. 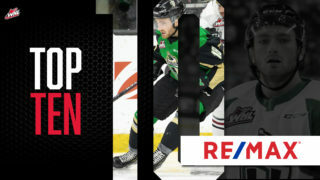 Puck drop is at 7:05 p.m. Tickets can be purchased in person at the Select Your Tickets box office, over the phone by calling 250-220-7777, or online at www.selectyourtickets.com.